After the Marlins beat the Nationals last night, the Mets magic number is finally in single digits. At a minimum, I thought it was nice to be off of 10. However, I saw the choices for 9, and I quickly realized it was going to be difficult to find a player that fits within my parameters. 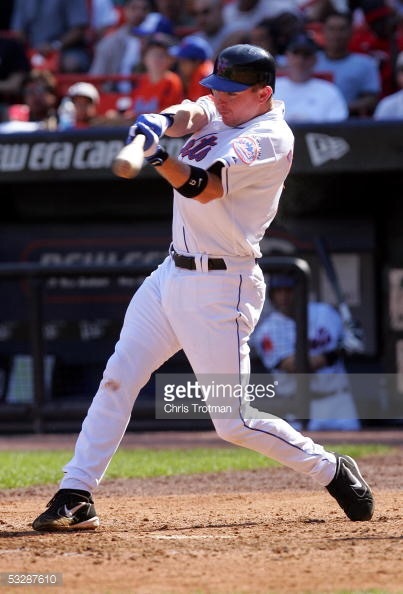 If you don’t remember him, it’s probably because he only played 24 games with the 2004 Mets, who went 71-91. In these 24 games, he would hit .265/.286/.412. He wouldn’t play in the majors for another three years when he would play five games for the Royals. It’s a shame because he was an actual major league prospect. He was a Top 10 organizational player seen to have good power and a good glove at firstbase. Unfortunately for him, he was blocked by the Mike Piazza firstbase experiment. The next season, he was blocked by Doug Mientkiewicz (because Carlos Delgado wouldn’t sign with the Mets). After 2005, he was granted free agency, and he left Mets organization. In some ways, Brazell reminds me of Ike Davis in that they were both good fielding first base prospects with power (Davis was a much better prospect). Unfortunately, neither panned out even if Davis had some early success. However, unlike with Brazell, the Mets had a viable option in their system with Lucas Duda. That’s what this season has taught us. You need organizational depth. You need it not just to get the players you need at the trade deadline, but also to fill-in spots for your team when there is injury or ineffectiveness. It’s unfortunate when the prospects work out. It’s devastating when there’s no viable alternatives at the ready. So with that, let’s offer a hat tip to our magic man number nine, Craig Brazell.